Despite their exotic, magical, mystical appearance, most Trilliums are quite easy to grow and Trillium cuneatum is no exception. 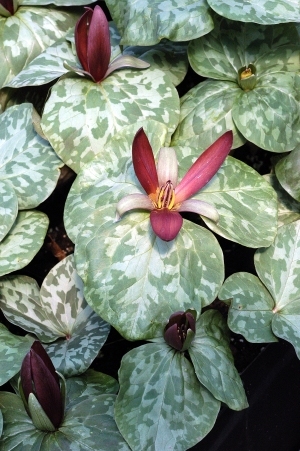 There are at least one or more Trillium species native to every state in the US but four. I've been growing and propagating many species of Trillium over the last 38 years and the only one that I wouldn't recommend for the average gardener is the lovely Trillium undulatum as you would really need specific acidic and moisture conditions for this particular species. You can grow Trilliums from seed, but they take 4-6 years to flower. Another simple way to build up your Trillium collection rapidly is by rhizome division. I plan to put up a "Propagation Information Section" on my web site sometime in the near future, but in the meantime, here's a visual for you. Anyway, as far as growing conditions go, most Trillium species prefer woodland conditions, which basically translates as light to medium shade with moisture retentive, but well drained soil. If these conditions don't exist naturally in your garden, it's not much of a chore to create them. Over the past 12 years I've been building quite a good stock of my personal favorite Trillium species, Trillium cuneatum, by rhizome division and now have more stock plants than I require. So, I'm offering you the opportunity to grow them in your garden. We've taken off our regular 3-5 year divisions and replanted our stock plants in 5" deep Anderson Treeband® Pots last Autumn and they are reestablishing themselves nicely. Trillium cuneatum is native to 11 Mid Atlantic and Southeastern states, but is hardy just about anywhere. Here's a plant that you will instantly fall in love with as its deep burgundy flowers bloom for an extremely long period of time in early to mid Spring. 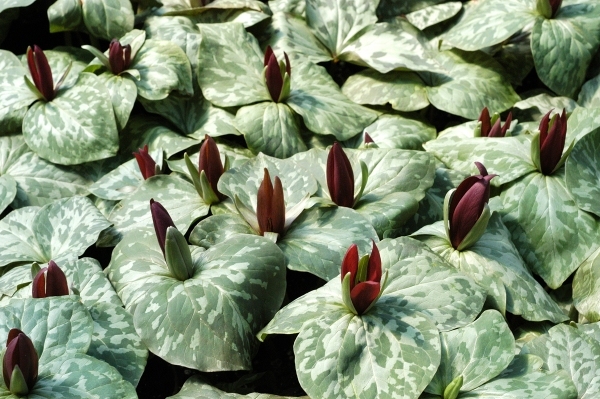 With the most exciting marbled foliage and with no two plants alike, their silvery leaves electrically light up even the shadiest of gardens. I wish I could say that Trilliums are fully deerproof, however this just isn't the case. But......... I can honestly say that it's not their first choice to munch on and in some years they completely ignore them. Again, they are very easy to grow and will give you and your garden visitors pleasure and enjoyment for many, many years to come. What you'll receive this time of year are 5" deep pots of flowering size, 5 to 7 year old plants in full active growth that have just finished flowering. 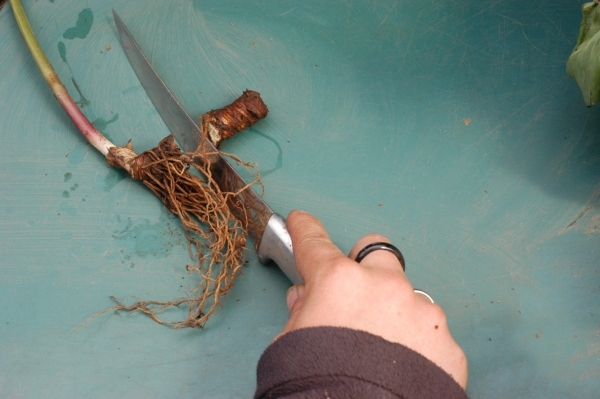 I almost always offer free shipping on all bareroot plants, but these plants are just too precious to take a chance with and I recommend that you get them in the pots. I usually offer even lower prices for larger quantities here, but must limit purchases to 20 per person on this particular plant.